Before you become fixated on the various furnishings and accents with which you might adorn your outdoor kitchen, its skeleton should be able to perform all the basic functions one would expect from an indoor kitchen. You should, therefore, ensure that it is fitted with a grill, gas stove top, sink, refrigerator and plenty of counter space. Even a bar could be considered a necessity, as it can define the kitchen as a gathering spot, rather than an isolated workspace. The edge of your countertop can be raised and paired with barstools for a space-efficient way to lure guests to the kitchen. Many people enjoy watching food being prepared, and are eager to lend a hand. Fixing a bar to the perimeter of your outdoor kitchen will enable them to do just that. Ensure that you’ve included the essential appliances in the design of your kitchen before filling the remaining space with fun extras like pizza ovens and warming trays. You should also consider keeping your appliances covered by having a pergola or overhead awning installed. This will protect them from harsh weather conditions and prolong their lifespans. Your outdoor kitchen is bound to contain electrical and gas-powered appliances, while most homeowners also opt to install a sink for quick washing up. You will therefore need to approach a contractor to take care of tasks like plumbing and the installation of electrical or gas lines. A contractor will also be able to pinpoint the best location within your landscape for the construction of an outdoor kitchen, taking into account where your existing utilities are positioned. Safety is another issue that must be thoroughly addressed before concentrating on your paver selection. You should ensure that all hot appliances are adequately ventilated to prevent fires. Flammable materials, such as wood and plastics should be kept at a safe distance from heat -generating appliances. Entrusting a professional contractor with the handling of utilities will also prevent incidents related to electrical lines and water pipes. 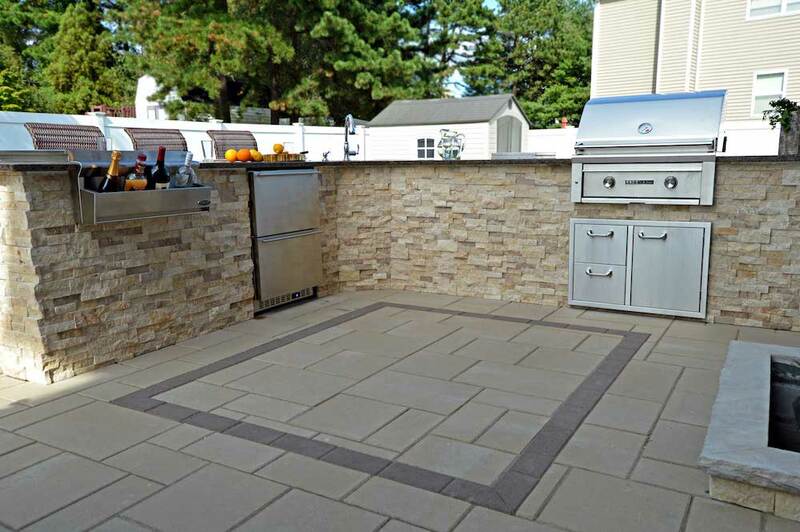 When planning the layout of your outdoor kitchen, grills and other hot appliances should be positioned far away from where children like to play, or where people tend to walk. Opt for non-slip materials for your kitchen floor and keep them brightly lit to prevent nasty falls. Natural stone is an attractive candidate for outdoor kitchens because it has an unmistakably luxurious appearance that adds style and character to any functional kitchen design. The rugged textures of authentic stone also create a stunning contrast beside sleek, metal appliances. Consider veneering the exterior walls of your built-in grill for a sense of indoor luxury. Sign up with your email address to receive an update, just once a month, with all our latest articles. MEET THE NOMINEES FOR THE WELCOME HOME 2019 CONTEST & VOTE!